Now I really love products. I like to see a counter with shiny tubs of magic cream and fancy balms - the whole skincare ritual is one that I find quite relaxing and at the end of the day I enjoy removing the grime and slathering myself in anything that purports to nourish and renew. At the same time I do think the skincare industry is a bit of a con. I remember asking a manager of a well known high-end cosmetics store what he thought really worked out of all the ranges they sold. His response was immediate. It was "absolutely nothing". Even the items with 3 figure price tags did the most superficial amount of skin refinement, in his opinion. Over the last few months I have noticed a surge in posts that talk about natural products. These posts typically talk about a back to basics approach to beauty. Items mentioned are the kind that you can pick up in a supermarket, at a fraction of the price that you would pay for an item from a cosmetics hall. The subsequent routines that people use them in are simple in approach. An oil to remove makeup and dirt and perhaps another oil to refine skin texture..if that. There is something really appealing about that. It's almost rebellious in a way because it subverts an entire industry and moves away from the type of products that marketers would have you think you are supposed to use. So I decided to give it a go. What's the worst that could happen? Ominous words to mutter when it comes to skincare! But here I am, almost 4 weeks later, after an experiment of sorts with coconut oil. This is me dipping my toe into the world of simple, natural skincare and all it took was a trip to the organic supermarket. Now coconut oil is a confusing one. Some users report horrendous breakouts but then others emphasise the fact that it is naturally anti-bacterial and anti-fungal. These are the people that don't get spots from it and instead get super soft, happy skin. That would be me...so far. I use this at night in the same way that I would Emma Hardie/Eve Lom cleansing balms. The only difference with application is that instead of enjoying the ritual of opening lux packaging, I dip my fingers into something that could, at the very best, be described as "utilitarian". Massage it into your skin, see the makeup melt and then use a warm wash cloth to gently massage it off. At first I didn't feel comfortable with only using this and applied Dermalogica's Dermal Clay Cleanser for round 2. I think part of that is not wanting to depart too far from my normal routine - the clay cleanser leaves my skin so fresh that it's addicting - and part of it is fear that the residual coconut oil needs to be fully removed. I have since relaxed this and am trying to only use only the oil. I even dab a little bit on as a moisturiser and lip balm before I go to bed. Sure, the hair around my head is permanently lank and greasy but if I get smooth and plump feeling skin then it's a sacrifice that I will be glad to make. You can use this for so much - shaving your legs/moisturising your hair and skin/massaging into cuticles/improving your immune system...it's powerful stuff. I am currently researching how I can blend this with other oils as I read that this often results in the most effective skincare routine. Now I wouldn't say that I will never peruse the upmarket skincare aisles ever again - I am product junkie after all - but I am really enjoying this simplicity experiment. As I said before, there is something really appealing to me about it all. What do you think? Would you/have you tried coconut/natural oils? 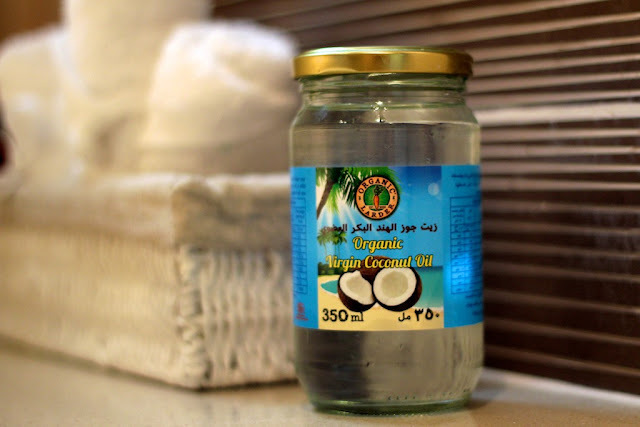 I love coconut oil for night. Have you tried using just pure Vitamin E? I haven't actually...this is like a whole new world for me :) Do you swear by it? Vitamin E oil is fantastic. It helps improve the appearance of scarring as well! I do love coconut oil, although my experiment is only a week in. I think it's been just as effective, if not better than most of my high end brands. Just goes to show (and makes me weep at the thought of how I much I've spend on "high end" products in the past. I just checked out your post :) I love this as a body moisturisers too! I really hope it continues to work well for the both of us! Do you carry on with the rest of your evening skincare routine after cleansing with the oil? I've used coconut oil as a moisturizer but not to cleanse. Does it leave a noticeable film of oil behind even after thorough rinsing? That's it :) I am not using a serum at the moment so it's eye cream and bed. I am trying to use up my over-abudance of "back up" makeup removers/cleansers/night time moisturizers first, but I have already purchased coconut oil to try once they are gone! Honey is actually really good on the face! It doesnt sound it but trust me it's amazing! Put it on at night and it will absoarb into your skin, youll wake up youthful and supple skinned. My love affair with coconut oil knows no bounds. There is no I, without it. It has become my hair's life partner. It gives my hair shine like no other! I WERK this hair! I swear by jojoba oil. I use it as a makeup remover, shaving cream, face/neck night time moisturizer, body oil, hair oil . . . I could go on. I really want to try coconut oil too though! So glad to hear that it is working for you - it seems refreshingly simple and effective! Unfortunately my skin does not like coconut oil - I bought some to use with the OCM, and ended up with those red painful cystic cheek spots - ouch! Still, I do use the rest of the tub on my cuticles and legs ... It smells so good! i think you will love using rosehip oil! i have been using it for god knows how long, sometimes alternating between cold pressed almond kernel oil! both works equally amazing, and i use them both as a moisturiser, yeap i am that brave :) please give them a go, you will get hooked on them! Have you ever used the Josie Maran Argan oil as a moisturizer? I just bought the "light" version and I am obsessed! My skin looks downright glowing when I wake up and no breakouts so far! Plus the cute little glass bottle and dropper make me happy! I'm obsessed with coconut oil. I started using it in my hair, and now I've progressed to using it to remove makeup, and on my cuticles as well. I haven't had any issues with breakouts, and since my hair is naturally curly and prone to dryness it doesn't leave it oily either. Its certainly cheaper than a lot of other products out there. Do you heat it? Is that why it's clear? She is in a hot climate and coconut oil melts at 24 degrees Celcius. If you're in the UK (or the Netherlands like me) it is usuallly solid white, which melts in your hands. It was only during the heatwave of July that it was pure liquid over here in the Netherlands. I've used coconut oil for cooking .. pancakes .. lol. But not skin care. I have to agree with the fact that none of the anti aging products work as I am 47 and I sure don't look like I'm 27. Youth is bottled up in good genetics, nutrition and avoiding the sun (my opinion of course). I have also recently become infatuated with natural products. I use coconut oil as a hair mask and leave it in my hair overnight, as well as for all the uses you mentioned. I would recommend to try using honey and lemon as a facewash. Both of the ingredients (are reported to) have amazing benefits such as pH balancing, anti-bacterial, etc. There are many websites that discuss them. The first time I used it a few weeks ago I excitedly got out of the shower and couldn't stop staring at my face. It's best to leave the wash on for as long as possible! If you dare, give it a try! I love that this product is multi-functional. I would absolutely love to try this. My Mother swears by vitamin E oil, cold pressed oils and coconut oil. I love the fact that coconut oil is so versatile and chocko block full of natural goodness. I've been only using oils for my hair. Can't wait to try out your tips!! I have switched over to coconut oil also, but kind of the opposite from you. I use my regular makeup remover, and then i use the coconut oil in place of my moisturizer and eye cream. I absolutely love it! I have super oily skin so I was really skeptical at first, but it soaks in quickly and my skin has never been softer/clearer. I've heard people say that anti wrinkle creams are a scam and that it doesn't matter as long as you moisturize that skin, and I think I'm starting to believe it because this has worked wonders for my crows feet! I've used Sweet Almond Oil to remove make-up and moisturize for a while know and absolutely love it! I started becoming more and more interested in natural skincare in the last months and have since discovered my love for oils. I love coconut, almond, walnut and a oil composite for oily skin from a German store. Next I want to try out avocado, cranberry and two more composites, one for the face and one for the skin around the eyes. Oils are such an exciting world! I always make sure to get organic oils, I think they offer the best quality. I use it as a moisturiser too - happy days ! I have just started using grapeseed oil as a treatment for my acne, but I think I might pick up so coconut oil to remove my makeup since I've run out of my cleansing milk. I don't think I could stop using my cleanser and toner. Mostly because I love them and since they're Kiehls they aren't at all expensive. Has the grapeseed oil helped with your acne? What about the scarring? I have actually been using coconut oil as my makeup remover and moisturizer for the past 3 months and absolutely love it, breakouts have slightly decreased and my face has a beautiful glow (post application, pre make up). i love to put coconut oil in my hair, gets it so nice and silky! follow it and I will follow back! I use coconut oil for more than a year now on my curly, unruly, very dry hair with good results (more recently I mix it with avocado oil which softens the ringlets). I wouldn't use coconut oil for my face since its concentration of oleic acid is too high for the oily, mixed-type skins. Instead, it is recommended to use the so-called "dry" oils such as: black currant oil, jojoba oil, borage oil, cranberry seed oil, evening primrose oil, grapeseed oil, hemp seed oil, rose hip oil, soybean oil, sunflower oil, wheat germ oil, pomegranate oil. Personally, I have used a mixture of rosehip oil, borago oil and jojoba oil and their combined properties add moisture to the skin. They penetrate easily into the skin and the next morning you won't have a greasy face. For dry skins, the most useful oils are the emollient ones: sesame oil, apricot kernel oil, argan oil, avocado oil, hazelnut oil, safflower oil, sweet almond oil, camellia oil, plum kernel oil, peach kernel oil, macadamia nut oil. Sweet almond oil is very good for the eye area and with continuous use it diminishes the dark circles. You can use it as an eye cream (at least that's what I do). If you blend several oils together, they should be kept in a brown glass bottle and for conservation purposes, you can add wheat germ oil which is a natural conservative (or Vitamin E). One should be careful though that the cosmetic oils become rancid in 3-6 months (the exception is jojoba oil) and most of them should be kept in the refrigerator in order to extend their usage life. On the other hand, oils should be used as an addition for hydration, they cannot replace entirely a well-formulated moisturizer since they don't have all the necessary ingredients (skin-identical, antioxidants, cell-communicating and anti-irritant). Hope it helps (it surely did when I discovered such information around 2 years ago). oleic acid: is it comedogenic? I am still finding that magical product to help with my acne and the scaring. I've just done a full review on the new L'Oreal Skin Perfection skincare range - you know the one with Cheryl Cole in the adverts? I absolutely love Coconut Oil! It's such a great multi purpose product - recently wrote a blog post all about its many uses if anyone's interested. I like it using it as an intensive hair & scalp treatment the most, as well as for shaving my legs with it! For as long as I remember, my grandmom has always told me to use coconut oil on my hair, because her grandmom always told her to do that. I find olive oil is more nourishing though. I might try this as I've just bought an expensive facial oil to remove my makeup. If this works just as well then I might as well go for the cheaper option, even if it is a little utilitarian! Finding oils has completely changed how I view my skin and regime entirely. For me, olive oil was the gateway for makeup removal. Then I moved onto coconut oil because it had a pleasant scent, and I used it as a makeup remover/cleanser/hair mask/shaving oil. Then I got bored because I am a product junkie, and I find that combination skin absolutely loves a combination of coconut and avacado oil. Soooo nourishing, soft and luscious. I still use a toner after my oil cleansing and I can't deny my weekly facial masks, but the oils have completely replaced my cleanser/moisturizers, and as a former oily girl, I can't believe that all it took was freaking oil to balance, hydrate and plump my skin. I am now one of those people who can walk out with just concealer and powder if I want to! I do love coconut oil as an hair treatment but would never use it on my face, I'm not convinced that this whole "going natural" approach works long term. laura will you ever be coming back to youtube..? We really do miss you and your voice! absolutely love using coconut oil and use it for numerous things including makeup removal, to shave my legs and as a hair masque. Even blogged about my love for it! I gulped when i saw that it has replaced your Emma Hardie Cleansing Balm though.. since I just purchased it for the first time! Ok ladies, for a real good cleanse with oil.. you need to add some castor oil to your chosen oil eg, coconut, sunflower, grapeseed, jojoba.. but you have to find the right balance.. too much castor oil not good, too little it won't be effective.. I am currently using dermalogica pre-cleanse which is nice smelling due to their combo, costs more than do it myself, but works well thoroughly breaks down the doublewear foundation, and waterproof mascara.. then I use a gentle cleanser to get rid of the oil. The other good thing about going back to basics is no parabens, no nasty ingredients.. so its also better for us. Literally everyone is talking about coconut oil, i need it in my life! It's just hard for me to find here in Canada but I am ready to set off on that mission! It also does really amazing things to your hair when used a conditioner. I use coconut oil for the ends of my hair as a conditioner, as a body lotion, and as a makeup remover. I use coconut oil in my hair to deep condition it and it works wonders. Also, sometimes when my face is super dry I will put the coconut oil on the dry patches, but I am worried about breaking out from it. I do want to try using it on the rest of my body though.
. Essential oils play an important role in anti aging skincare routine for staying young. The regenerative properties of essential oils are believed to be especially effective at treating mature skin and reducing the appearance of wrinkles and fine lines. The nutrients and proteins found in anti aging essential oils encourage new cell regeneration and help the skin to maintain its elasticity and firmness. One of the best advantages of using essential oils as anti-aging agents is that essential oils deliver and retain moisture in dry skin without clogging pores. I have oily acne prone skin and when I use coconut oil on my face and whole body my skin radiates and has a supple quality that no lotion creme or body butter has ever given. I shave with it mix it in with my body wash and apply it on my face as well. It has not broken me out has made shaving easier and absoarbs really really quickly. If i do it at night i put a generous amount on my face without a worry because itll be gone by morning. Heres to soft supple youthful looking skin. By the way i use the big jar from costco but transfer it into a smaller bottle for the bathroom. If you are not happy with the way your skin looks, visit a skin Plus clinic for help. There are so many different types of procedures that you can have done. You can learn about the available types and find out which ones would be most beneficial for you. Coconut oil as a hair mask is the only and best option i think as i have been using it for many days and got a very positive results. For skin one should have to go for natural cosmetics, which are having natural ingredients. Try to use cosmetics that are chemical free. Thanks for your post ! Yes.. u r absolutely right... Coconut oil really works. I personally used it and feel the difference.. I love using coconut oil! I always shave my legs with it and sometimes use it as a moisturizer. I also made those DIY makeup remover wipes on pinterest and added coconut oil. It is fabulous. I recently bought Vitamin E oil & have been rubbing it around my cuticles. I am curious about other oils! "Download Your FREE Guide And Discover 50 Ways To Treat Acne Using Only Natural Remedies..."
THIS IS A FANTASTIC MULTIFUNCTIONAL PRODUCT. Very nice information thanks for sharing. Do you want to know all the more about itchy Scalp treatment, then go to Scalp treatment Delhi website page on how one can select the top bothersome scalp and dandruff for your needs and what it can accomplish for you. Nice article. Good to know that these products works for you. But for me the secret of glowing skin is sakare products. Hello my friend! I would like to tell you that this write-up is awesome, great written and include almost all important info. I recently came to know about www.avanaaustralia.com, their Natural Skincare are very effective. Simple and natural organic ingredients always prove to be fruitful for the skin especially the natural organic oils. These are natural moisturizing agents. To plump out wrinkles and lines for natural younger look www.cosmedocs.com/treatments/botox-treatment.php offers a good option. Thanks for sharing this article,Its an great article. Definitely i will try it and i heard many other uses of coconut oil but about this i was not knowing thanks for the post.